Not to be confused with Duathlon or Biathle. According to Encyclopædia Britannica, the biathlon "is rooted in the skiing traditions of Scandinavia, where early inhabitants revered the Norse god Ullr as both the ski god and the hunting god". In modern times, the activity that developed into this sport was an exercise for Norwegian people that was an alternative training for the military. Norwegian skiing regiments organized military skiing contests in the 18th century, divided in four classes: shooting at mark while skiing at top speed, downhill race among trees, downhill race on big hills without falling, and a long race on flat ground while carrying rifle and military pack. In modern terminology these military contests included downhill, slalom, biathlon, and cross-country skiing. One of the world's first known ski clubs, the Trysil Rifle and Ski Club, was formed in Norway in 1861 to promote national defense at the local level. 20th century variants include Forsvarsrennet (the military contest) – a 17 km cross-country race with shooting, and the military cross-country race at 30 km including marksmanship. The modern biathlon is a civilian variant of the old military combined exercise. In Norway, the biathlon was until 1984 a branch of Det frivillige Skyttervesen, an organization set up by the government to promote civilian marksmanship in support of national defense. In Norwegian, the biathlon is called skiskyting (literally ski shooting). In Norway there are still separate contests in skifeltskyting, a cross-country race at 12 km with large-caliber rifle shooting at various targets with unknown range. Called military patrol, the combination of skiing and shooting was contested at the Winter Olympic Games in 1924, and then demonstrated in 1928, 1936, and 1948, but did not regain Olympic recognition then because the small number of competing countries disagreed on the rules. During the mid-1950s, however, the biathlon was introduced into the Soviet and Swedish winter sport circuits and was widely enjoyed by the public. This newfound popularity aided the effort of having the biathlon gain entry into the Winter Olympics. The first Biathlon World Championship was held in 1958 in Austria, and in 1960 the sport was finally included in the Olympic Games. At Albertville in 1992, women were first allowed in the Olympic biathlon. The competitions from 1958 to 1965 used high-power centerfire cartridges, such as the .30-06 Springfield and the 7.62×51mm NATO, before the .22 Long Rifle rimfire cartridge was standardized in 1978. The ammunition was carried in a belt worn around the competitor's waist. The sole event was the men's 20 km individual, encompassing four separate ranges and firing distances of 100 m, 150 m, 200 m, and 250 m. The target distance was reduced to 150 m with the addition of the relay in 1966. The shooting range was further reduced to 50 m in 1978 with the mechanical self-indicating targets making their debut at the 1980 Winter Olympics in Lake Placid. For the 2018/2019 season, fully electronic targets were approved as an alternative to paper or mechanical steel targets for IBU events. In 1948, the International Modern Pentathlon Union was founded, to standardise the rules for the modern pentathlon and, from 1953 also biathlon. In July 1993, the biathlon branch of the UIPMB created the International Biathlon Union (IBU), which officially separated from the UIPMB in 1998. The following articles list major international biathlon events and medalists. Contrary to the Olympics and World Championships (BWCH), the World Cup (BWC) is an entire winter season of (mostly) weekly races, where the medalists are those with the highest sums of World Cup points at the end of the season. Prone position: Sylvie Becaert, Antholz 2010. Standing position: Raphaël Poirée (left) and Ole Einar Bjørndalen, Antholz 2006. The complete rules of the biathlon are given in the official IBU rule books. A biathlon competition consists of a race in which contestants ski through a cross-country trail system whose total distance is divided into either two or four shooting rounds, half in prone position, the other half standing. 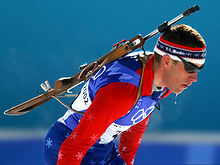 Depending on the shooting performance, extra distance or time is added to the contestant's total skiing distance/time. The contestant with the shortest total time wins. Skiing around a 150 m penalty loop—typically taking 20–30 seconds for elite biathletes to complete, depending on weather and snow conditions. Adding one minute to the skier's total time. Use of an extra cartridge (placed at the shooting range) to hit the target; only three such extras are available for each round, and a penalty loop must be done for each target left standing. 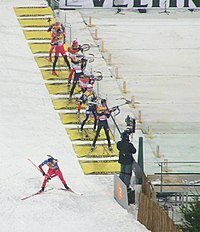 In order to keep track of the contestants' progress and relative standing throughout a race, split times (intermediate times) are taken at several points along the skiing track and upon finishing each shooting round. The large display screens commonly set up at biathlon arenas, as well as the information graphics shown as part of the TV picture, will typically list the split time of the fastest contestant at each intermediate point and the times and time differences to the closest runners-up. In the Olympics, all cross-country skiing techniques are permitted in the biathlon, allows the use of skate skiing, which is overwhelmingly the choice of competitors. The minimum ski length is the height of the skier minus 4 cm. The rifle has to be carried by the skier during the race at all times. The biathlete carries a small-bore rifle, which must weigh at least 3.5 kg, excluding ammunition and magazines. The rifles use .22 LR ammunition and are bolt action or Fortner (straight-pull bolt) action. Each rifle holds 4 magazines with 5 rounds each. Additional rounds can be kept on the stock of the rifle for a relay race. The target range shooting distance is 50 m. There are five circular shooting targets to be hit in each shooting round. When shooting in the prone position, the target diameter is 45 mm; when shooting in the standing position, the target diameter is 115 mm. This translates to angular target sizes of about 1 and 2.5 mrad respectively. On all modern biathlon ranges, the targets are self-indicating, in that they flip from black to white when hit, giving the biathlete, as well as the spectators, instant visual feedback for each shot fired. Ear protection is not required during biathlon shooting as the ammunition used is usually subsonic. An eyecup (blinder) is an optional feature of biathlon rifles. The 20 km individual race (15 km for women) is the oldest biathlon event; the distance is skied over five laps. The biathlete shoots four times at any shooting lane (Lanes 1 - 15 are in prone while Lanes 16 - 30 are for standing. )., in the order of prone, standing, prone, standing, totaling 20 targets. For each missed target a fixed penalty time, usually one minute, is added to the skiing time of the biathlete. Competitors' starts are staggered, normally by 30 seconds. A variation of the standard individual race, called short individual, was introduced during the 2018–19 Biathlon IBU Cup. The races are 15 km for men and 12.5 km for women and for each missed target 45 seconds will be added to the skiing time. The sprint is 10 km for men and 7.5 km for women; the distance is skied over three laps. The biathlete shoots twice at any shooting lane, once prone (Usually Lanes 1 - 15) and once standing (Lanes 16 - 30), for a total of 10 shots. For each miss, a penalty loop of 150 m must be skied before the race can be continued. As in the individual competition, the biathletes start in intervals. Introduced at the 2017–18 Biathlon IBU Cup, the Super Sprint is a shorter version of the sprint race. Unlike the traditional sprint race, the Super Sprint is divided into two segments – qualification and final. The qualification is done like the traditional sprint, but on an 0.8 km lap with total length of 1.6 km. Only the top 30 competitors qualify for the final, in which all competitors start simultaneously and do 5 laps on the same course (like in mass start) with total race length of 4 km. During the final the competitors have 3 spare rounds should they miss a target (like in relay race), but if not all targets are cleared during shooting instead of going to penalty loop, the biathlete is disqualified from the race. Changes were made for the following season with the course now being 1 km (0.2 km increase) meaning that the qualification race length will become 2 km, while the final race becomes 5 km in length. Also the number of spare rounds was decreased from three to one. Olympic gold medalists Olga Zaitseva, Andrea Henkel and Marie Dorin-Habert at the World Cup pursuit race in Oberhof, 2013. In a pursuit, biathletes' starts are separated by their time differences from a previous race, most commonly a sprint. The contestant crossing the finish line first is the winner. The distance is 12.5 km for men and 10 km for women, skied over five laps; there are four shooting bouts (two prone, two standing, in that order), and each miss means a penalty loop of 150 m. To prevent awkward or dangerous crowding of the skiing loops, and overcapacity at the shooting range, World Cup Pursuits are held with only the 60 top ranking biathletes after the preceding race. The biathletes shoot on a first-come, first-served basis at the lane corresponding to the position they arrived for all shooting bouts. In the mass start, all biathletes start at the same time and the first across the finish line wins. In this 15 km for men or 12.5 km for women competition, the distance is skied over five laps; there are four bouts of shooting (two prone, two standing, in that order) with the first shooting bout being at the lane corresponding to the competitor's bib number (Bib #10 shoots at lane #10 regardless of position in race), with the rest of the shooting bouts being on a first-come, first-served basis (If a competitor arrives at the lane in fifth place, they shoot at lane 5). As in sprint and pursuit, competitors must ski one 150 m penalty loop for each miss. Here again, to avoid unwanted congestion, World Cup Mass starts are held with only the 30 top ranking athletes on the start line (half that of the Pursuit as here all contestants start simultaneously). Starting in the 2018/2019 season, the Mass Start 60 becomes part of the International Biathlon Union (IBU) competition formats. The Mass Start with 60 starters does not replace the current Mass Start with 30 starters. The relay teams consist of four biathletes, who each ski 7.5 km (men) or 6 km (women), each leg skied over three laps, with two shooting rounds; one prone, one standing. For every round of five targets there are eight bullets available, though the last three can only be single-loaded manually one at a time from spare round holders or bullets deposited by the competitor into trays or onto the mat at the firing line. If after eight bullets there are still misses, one 150 m (490 ft) penalty loop must be taken for each missed target remaining. The first-leg participants start all at the same time, and as in cross-country skiing relays, every athlete of a team must touch the team's next-leg participant to perform a valid changeover. On the first shooting stage of the first leg, the participant must shoot in the lane corresponding to their bib number (Bib #10 shoots at lane #10 regardless of position in race), then for the remainder of the relay, the relay team shoots on a first-come, first-served basis (arrive at the range in fifth place, shoot at lane 5). The most recent addition to the number of biathlon competition variants, the mixed relay is similar to the ordinary relay but the teams are composed of two women and two men. Legs 1 and 2 are done by the women, legs 3 and 4 by the men. The women's legs are 6 km and men's legs are 7.5 km as in ordinary relay competitions. This event was first held at the Biathlon World Championships 2005 in Khanty-Mansiysk, and it was added to the 2014 Winter Olympics. In 2015, single mixed relay was introduced to the Biathlon World Cup by the IBU. Competing on a 1.5 km track, each team has a woman and a man, running respectively for 3 km + 3 km (2 + 2 laps) & 3 km + 4.5 km (2 + 3 laps), totalling 13.5 km. Specific to this format, relay happens immediately after the last shooting of each series, and not after a following lap as it happens normally. Either women or men starting is the result if a decision if the IBU Technical Committee. Since the last series has a supplemental lap between the last shooting and the finish line, it is most probable women will always start and men finish this race category. This event was first held at the Biathlon World Championships 2019 in Östersund. A team consists of four biathletes, but unlike the relay competition, all team members start at the same time. Two athletes must shoot in the prone shooting round, the other two in the standing round. In case of a miss, the two non-shooting biathletes must ski a penalty loop of 150 m (490 ft). The skiers must enter the shooting area together, and must also finish within 15 seconds of each other; otherwise a time penalty of one minute is added to the total time. Since 2004, this race format has been obsolete at the World Cup level. Biathlon events are broadcast most regularly where the sport enjoys its greatest popularity, namely Germany (ARD, ZDF), Austria (ORF), Norway (NRK), France (L'Équipe 21), Finland (YLE), Estonia (ETV), Latvia (LTV), Lithuania (LRT), Croatia (HRT), Poland (Polsat), Sweden (SVT), Russia (Russia-2, Channel One), Belarus (TVR), Slovenia (RTV), Bosnia and Herzegovina (BHRT), Bulgaria (BNT), and South Korea (KBS); it is broadcast on European-wide Eurosport, which also broadcasts to the Asia-Pacific region. World Cup races are streamed (without commentary) via the IBU website. The broadcast distribution being one indicator, the constellation of a sport's main sponsors usually gives a similar, and correlated, indication of popularity: for biathlon, these are the Germany-based companies E.ON Ruhrgas (energy), Krombacher (beer), and Viessmann (boilers and other heating systems). ^ Bø, Olav: Skiing throughout history, translated by W. Edson Richmond. Oslo: Samlaget, 1993. ^ Nordvall, Michael (2017). Two Skis and a Rifle: An Introduction to Biathlon. ISBN 978-1386671152. ^ "Biathlon: a sport on the cutting edge". olympic.org. 23 February 2015. Retrieved 25 January 2018. ^ "IBU Congress: Olle Dahlin (SWE) elected as new IBU President". International Biathlon Union - IBU. Retrieved 2018-12-19. ^ a b c d 11TH Regular IBU Congress (2014). "IBU Rules" (PDF). International Biathlon Union. pp. 4–8, 4–9. Retrieved 2018-12-19. ^ "Competition format and rules: Biathlon, as of January 2018" (PDF). 2018. Archived from the original (PDF) on 2018-02-13. Retrieved 2018-03-30. ^ Staff (2018). "Top 10 Questions". Jackson Biathlon. Retrieved 2018-12-19. ^ Staff. "US Biathlon Association Coaches' Education" (PDF). www.anchoragenordicski.com. US Biathlon. p. 6. Retrieved 2018-12-19. ^ a b c "Some Changes at the IBU Cup". International Biathlon Union - IBU. Retrieved 2019-02-03. ^ "International Biathlon Union - IBU". International Biathlon Union - IBU. Retrieved 2019-02-03. ^ Pursuit competition start intervals are determined by common rounding to the nearest whole second of the biathletes' time differences from the previous race – the amount of time each biathlete lagged after the winner to the finish line. ^ Editors (October 28, 2018). "I (BU) got new rules, I count 'em!". biathlon23. Retrieved 2018-12-19. ^ "Single Mixed Relay: an Exciting New Format". International Biathlon Union - IBU. Retrieved 16 March 2019. ^ Staff. "IBU". International Biathlon Union. Retrieved 2018-12-19. ^ IBU (2016). "The Biathlon Family". biathlonworld.com. International Biathlon Union. Retrieved 2017-02-11.